Fiber to the home (FTTH), likewise called "fiber to the premises" (FTTP), is the establishment and utilization of optical fiber from a main issue straightforwardly to singular structures, for example, living arrangements, condo structures and organizations to give extraordinary rapid Internet access. It is a carrier network also known as neutral network where unlimited service providers can be carried through one FTTH cable as per the customers leverage regarding the choice of ISP whether it is Reliance, Tata, MTS, Airtel or any other service provider he would be selecting. FTTH drastically builds the association speeds accessible to computer users contrasted with technologies now used in most places. Fiber to the home (FTTH) is the conveyance of an interchanges motion over optical fiber from the administrator's exchanging gear the distance to a home or business, in this way supplanting existing copper framework, for example, phone wires or, on the other hand coaxial link. Fiber to the Home (FTTH) is an interesting innovation being conveyed by Triple play without precedent for India. The fiber availability having unlimited transfer speed and best in class innovation gives fix to access platform to convey the high speed broadband upto 100 Mbps, IPTV having diverse kind of substance like HDTV and future coming 3D TV and scope of voice communication services. It gives a complete answer for the IP rented line, web, Closed User Group (CUG), MPLS-VPN, VoIP, video conferencing, video calls and so forth whatever the services are accessible on the internet platform, transfer speed on request can be delivered by this connectivity without changing the access fiber and home gadgets. Client will get a CPE called Home Optical Network Termination (HONT) comprise of 4X100 Mpbs Ethernet ports and 2 typical Mobile ports. Every 100 Mbps ports will give broadband, IPTVs, IP Video call and rented line and so on as required by the clients. Client will get control back unit having full load reinforcement of four hours and ordinary reinforcement of three days. This power reinforcement will be AC input and interfacing with the HONT on 12V DC. Availability by means of FTTH: Triple play has expanded fiber from its closest Central Office (CO) area straightforwardly or through franchisee and has introduced HONT and battery reinforcement at the clients recognized areas. The services for example Voice Video data, Broadband, IPTV and etc are getting empowered according to the customers query for plans for the same. 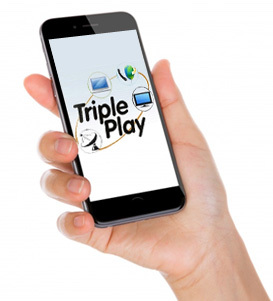 Triple play has begun Fiber to the Home (FTTH) in Delhi ,Noida, Ghaziabad, Gurgaon, Faridabad Mumbai, Bhiwari ,Kolkata, Ajmer and in the blink of an eye going skillet India. Now individuals can appreciate fiber at their home having data transmission speed they longed for. They can understand the speed of Internet up to 100 Mbps, Multiple IPTV associations, VoI Pbased Telephone benefit. What number of individuals will utilize your association? The more individuals utilizing your association, the slower it will be for everybody. On the off chance that you have a substantial family or live in a mutual house with at least four, you should search for bundles that are sufficiently quick to oblige everybody utilizing it in once. We'd likewise emphatically suggest shared pads and families run with a boundless bundle. This is the most well-known sort of arrangement nowadays, generally accessible from most suppliers, and means you can utilize the web without agonizing over being cut off or charged additional for more information. •	Large family unit of at least four normal clients: Unlimited fiber optic broadband, download accelerates to 38Mb+. •	Shared home with up to four individuals: Unlimited broadband, up to 17Mb, ought to be sufficient much of the time. In the event that you watch a considerable measure of films or download diversions, you could at present advantage from a speedier association, however standard broadband will in any case carry out the activity. •	Solo client: If you're a light client, essentially utilizing the web for email, perusing, or web-based social networking, at that point you might approve of a minimal effort bundle with settled utilization restrict. What broadband speed do you require? On the off chance that you've pondered the initial two inquiries, you may have a smart thought of what kind of paces you require, however there some different things you should consider. Will you stream or download TV and motion pictures frequently? This present one merits isolating out into its own particular point, as staring at the TV and motion pictures online has turned out to be critical for a few people. In the event that you frequently tune into on request benefits like Netflix, Amazon Prime Instant Video or BBC iPlayer, you'll require a bundle that can suit it. Video swallows the gigabytes to a great degree rapidly, so boundless use is significant. On the off chance that you can bear the cost of it, we'd likewise suggest fiber, as the high transfer speed will limit buffering and take into account top notch quality. All things considered, on the off chance that you can't get superfast fiber, a standard bundle will at present sensibly well for the vast majority. •	If you're a normal client of TV and film administrations: Unlimited broadband. Fiber ideal, yet not basic. 4. What home bundle do you require (if by any stretch of the imagination)? Numerous broadband suppliers package call designs into their bundles, so it merits contemplating what you require from your home telephone - or regardless of the possibility that you require one by any stretch of the imagination. The most well-known three sorts of call design accessible are: pay as you go, night and end of the week calls, and comprehensive whenever calls - and you can likewise get versatile and worldwide calling designs from a few suppliers. •	If you utilize the telephone a ton, and are at home amid the day: redesign your bundle to incorporate whenever calls. This implies you can call anyplace in the UK whenever without bringing about extensive charges. •	If you work Monday - Friday, or regularly make calls following 7pm: comprehensive night and end of the week calls will suit you best. •	If you have loved ones abroad: most suppliers have universal calls accessible, regularly as an additional dart on. The nations these cover differ from organization to organization, so check your coveted region is concealed before marking. •	If you don't utilize a home telephone, or like to stick to portable: pick a compensation as you go bundle. That implies you'll just get charged on the off chance that you make a bring over your landline - and on the off chance that you don't have or utilize a telephone, that won't occur.